In the gamified classroom, one of my biggest challenges was setting up the systems of opposition and challenge to motivate learners/players and to sustain their motivation/learning. The literature on game design is frequently focused on theory associated with these questions, because we all know what happens when we play games where there is little opposition or challenge. Candy Land, anyone? This question vexed me throughout the process of designing and then teaching America 3.0 and in fairness, I don't think I ever really hit on the answer. There were two major problems that I encountered. The first problem was the question of the game versus the players. How difficult was the game/course? For many students, merely understanding what was expected of them was so difficult, that they struggled, even months later, to move past this point, despite regular explanation. I discussed this challenge in a previous post. For other students, the course was easy enough to understand, but they challenge facing them wasn't structured as well as it might have been. As a result, they would bog down very early in a problem that I thought was straightforward, or at least doable, which they found difficult or impossible. Hence the practice of "nerfing" the experience. The lesson for me and for you if you are thinking of gamifying your classroom is to be mindful of the challenge you establish for your students/players, and how essential it is that these challenges be structured so that students can manage them. Be prepared, particularly in the first year, for this challenge. Interestingly, the younger your students, the less likely this will pose a problem. "One of the examples in gaming with the MMORPGs, as you pointed out, were the boss battles. These boss battles could be done individually or with a team. I think your spirit of competition ideal could spawn from these battles. In other words, what better way to provide competition than defeating a boss, or seeing what individual or team could beat the boss most effectively." "Also, the "random encounters" idea in the other teacher's classroom would be a good place to start. One random day per week, you could divide the students into any number of individual or group combinations. These groups would compete to answer questions in your "modeling" form, and if you chose, winning these random encounters would have no impact on their level or grade. What is the purpose of a random encounter in an RPG? For me, it has been to fight weaker monsters to be able to beat the stronger bosses through stat increases. What is the purpose of a random encounter in a gamified classroom? To apply my current knowledge to be able to effectively challenge and solve a larger issue or problem through confidence increases." Take a look at that last sentence again. Application of knowledge...this is at the core of great games, gamified learning and game-designed courses. By structuring the student's experience effectively, this would give the student the opportunity to demonstrate mastery of a skill or a content concept. By structuring it like a random encounter, it generates the "spirit of competition" that most of the game literature suggests is critical for successful game-based instruction. It reminds me of the Food Network program "Sweet Genius," in which the contestants are given a baking/candy making challenge and then part way through the challenge, have an additional obstacle put before them in the form of new ingredients that have to be incorporated into the mix. I am very much looking forward to incorporating these ideas into my class next year. 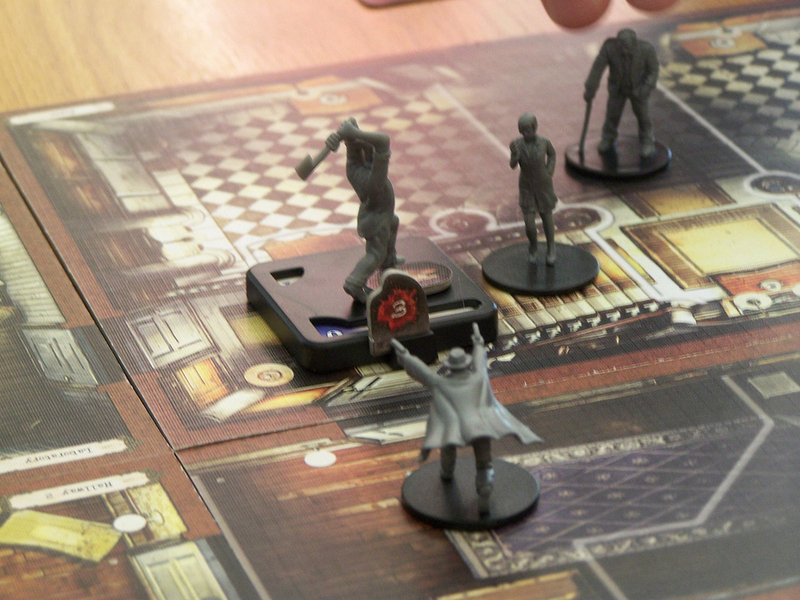 Mansions of Madness - an example of a boardgame featuring competition and cooperation.